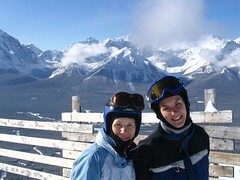 OK, so mom and I didn't exactly go to Lake Louise this weekend. But we did manage to get out on the slopes for a half-day at Mount St. Louis Moonstone. It was a little grey and quite cold and the line ups were long since everyone's been anxious about getting out there after our spring-like December. Strangely, our butts got cold. And we tucked our fingers and thumbs inside our fists when we were going up the lifts. But otherwise, our goal of getting our ski-legs worked out great. We did almost every run there is (except some of the crappier greens), including the hardest black diamond runs that still didn't have their moguls built up. It actually made for some more varied skiing for us, so no complaints there. Then I got to go home and sit with my feet up at the wood stove, reading Maclean's magazine, drinking tea, with a cat asleep on my lap. Nice. These are the weekends that I love! When mom brought me home on Sunday, I was happy to discover that Alex had put up a coat rack finally! YAY! 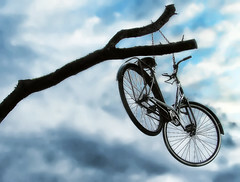 Some place to hang our coats! And, on top of that, we made chicken with red wine sauce for dinner (a recipe that was easy that I really like and which Alex also liked but threw out immediately after using). I was standing there, listening to the amazing, sometimes eery, sometimes soothing music, my feet shuffling back and forth as the acrobats at the opening of Toronto's WinterCity climbed a rope-riddled cube of scaffolding and threw themselves down the middle jumble of ropes, much like a game of Kerplunk! 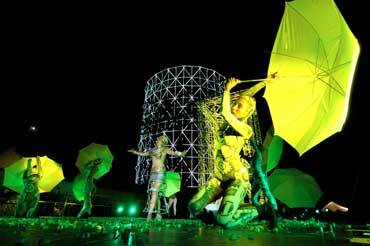 The performance was put on by a group called Kitonb, an "extreme" theatre company from Italy. I'm not sure if they expected it to be that cold. I didn't. I finally got the blood flowing to the toes. And then they played one of my favourites (Oleo) and broke it down and it started going on forever and ever... I like the band. And they're fantastic musicians. But I do not like wanking like that. Anyway, great show. Fantastic free entertainment. Check out the rest of the cool WinterCity events happening in Toronto here. Just discovered a new event series in the city: Green Carpet Series. Upcoming, January 30th, is An Evening of Sustainable Style. Too bad it's $40, or I'd be at this on date-night. Unfortunately, next week's date is already set for Winterlicious. Tonight, I'm headed out to the opening celebration of WinterCity. Can you help but be happy in a place when you get a morning email from the CEO that says "I am lucky to have such wonderful people on our team. We are all lucky to work at such a place..."
What a great place - I never thought it could be so good. So I decided to set up an account at Facebook, the MySpace for big people. I uploaded some photos. YAY, fun. More photos to come. Double yay. Watched Who Killed the Electric Car last night. Great documentary. Very frustrating also. I had no idea that this happened in 2003 - did you? California passed a zero-emissions law and then REPEALED it based on pressure from the car manufacturers.Why did the car manufacturers care so much? The FEDERAL government also sued the California government over the law. Why? Pressure from oil-rich countries who feared the biggest market for their product was going to a smarter choice? The Feds wanted to keep good relations with these dirty-energy producers? Hydrogen fuel cells became the new en-vogue alternative. Why? It's proven that they're not as good, as efficient, etc. Could it have anything to do with the fact that the head of the environment counsel that repealed the law was heading up the fuel cell initiative? Good questions, all. Can anyone know for sure? But watch the movie. There's something fishy about all this. Why didn't we know about this? Why isn't anyone ALLOWED to drive electric cars? Why wouldn't GM renew leases? Why did they crush all of the cars? Why, when people offered to buy up the leases of their beloved electric cars (for more than what they were worth, actually) did GM refuse AND crush all of the vehicles, not recycling any of the parts that they had promised they would. If GM is failing as a company, there is no doubt in my mind that they deserve it. They made a choice to turn their back on and deliberately suppress a technology that would have put them years ahead of any other car manufacturer. They made a choice to antiquate themselves in favour of the Hummer. Yep, instead of producing electric cars, they produced Hummers. Garbage. Absolute garbage. I'm not pretending to think that the movie tells the whole story. I'm sure there are facts I don't know. But I AM sure that there is something very dodgy about the whole deal. My favourite eye-rolling moment was when some piece of white trash in the documentary actually said that the electric car would force us (North Americans) to live like Europeans. Living in a more sustainable manner. Can you imagine? Sometimes I despair of the times in which I live. Mummy, where do all the bikes come from? Found out only last night that Toronto's BikeShare program is in jeopardy. Do you know the one I mean? The yellow bikes around the city that you can sign out and ride around for a one-time membership fee. Totally great idea. And if you read the article, you'll know the program has won many awards. So why is the funding in jeopardy? One question in the article in eye that didn't get answered was about how much use the program gets. Do people actually use it? Are the bikes in demand? Is that why the funding slipped? I mean, maybe the marketing program sucked. It kind of did. I wouldn't have known about it if I hadn't seen a bunch at Nathan Phillips Square and looked it up. And to be fair, I have never used it. But then, I OWN a bike. But upon reading the story last night, I realized that Alex doesn't own a bike and I kept lamenting that we could never go on a bike ride together. Well, duh, we could have, I now realize. Except I just looked up the Community Bicycle Network hubs and realized that the nearest hub to us is about a 20-25 minute walk. Not the most convenient, really. But I could have used it other times. I just didn't. Maybe the problem is that people don't feel safe bike riding in Toronto. Fair concern. It's dangerous because drivers aren't accustomed to it, there aren't enough bike lanes, and people don't actually do it much. Anyway, I hope that they can make the program work. Maybe if it were better funded, they could expand it and then there would be a hub near me and we actually would use it. I mean, a $50-membership is a really cheap way to get around for the summer months, isn't it? Last night, I had a really nice date-night. We went to Famous People Players and saw the show "Hide and Seek" which had a bit of a Christmas theme to it. It was a nice dinner and the people working there were really nice. The show was... OK. I think I've just heard so many great things about it, that I was maybe expecting more. The performance was good, but the story was a little weak. I feel like a horrible person even just saying that because of what the theatre is all about. However, the are doing amazing things there and I'm thinking that maybe I should have waited to see Alice in Funkyland instead. Whatever, it was still nice. Afterward, we went to Starbucks and talked a bit. Alex had some work stress to get out of his system. He'd pulled a couple of all-nighters in a row and was just recovered. So this was a nice way for us to spend some time together outside the house. I think that's the key for us right now. The house brings me stress, I've discovered. I love having plans and goals. And right now, I don't have a plan for how to get everything done. It makes me uncomfortable. Anxious. So, Tuesday night, after tutoring and coming home to make myself a bagel for dinner (I'm addicted to toasted bagels and crunchy peanut butter), I decided I had to DO something. So I set to work on finishing my wardrobe. It's been there, unfinished, since October. Over the holiday, Alex put on the lights and the handles. And Tuesday, I put in all the shelves and drawers! I felt so great about it! One more item to strike off my list! 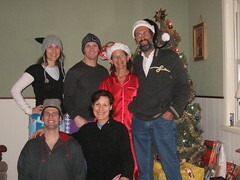 Just got back from visiting my parents - stayed over after a fun formal dinner party at Matt and Kendra's house in Guelph. It was a great party - I got to wear my old bridesmaid dress from over 2 years ago. It's a little bit too big, but I guess it always was anyway. It's just got a little extra room now. At my parents', we watched the remaining episodes of Firefly as well as the movie, Serenity. Can't understand why they cancelled the show. It was great. Anyway, now I'm back at home and feeling that the weekend was again too short. I've been feeling so run down lately. Maybe it's the winter blues. Chimera - saw this sleeper on Friday. Skip it. But happy that I got out to some theatre anyway. Trip to Calgary - just bought our flights to Calgary for $400! Not bad! (Now watch it go on sale even more.) So, here's to my upcoming ski vacation in March! I'm trying to book a flight to Calgary in around March and I thought that WestJet and Air Canada were having sales. I can't tell if their sales are any good or if I should wait to book. The best flight I've found is for around $415 round trip? Any ideas when the best time is to buy the flight? What's a really good deal? I can't remember what I've paid in the past! A day - all to myself - newly discovered. Sometimes when plans get canceled I get unhappy or disappointed. But now I'm happy that I got to have a leisurely morning of homemade tea mistos and good reading and eggnog french toast. Mm. I've thought fleetingly about going grocery shopping. For now, I've got some heavy page-turning to do. I can't put down the book that my friend Kat gave me at New Years. The Queen's Fool by Philippa Gregory. b) had the summary of the book below it. So I'm loving it. And I'm loving reading again in general. Yes, it's not the most challenging piece I've ever consumed, but I love the mindlessness of it. Actually, I don't find it mindless at all. I find that my imagination is sparked by reading, almost no matter what it is, unless of course it is exceedingly boring, which this is not. I find myself picking up words and language. I find my inner eye creating vibrant scenes of excitement. I even feel my own body infused with adrenaline at the most suspenseful moments. I find it is waking up my mind. And I'm glad of a quiet house to read in, as well as a cubicle door that slides closed on my lunch hour, which the book is inspiring me to actually take. The only thing that could make it better? Being able to read it outside in the sunshine. I have several bios of friends on my site that are short and sweet, but I'm slowly, labouriously and messily building a bio of myself with this blog. One thing you should know about me: I love chocolate. So I found this article about the economics of chocolate which followed an investigative report about chocolatier NOKA. The writer of the report HATES NOKA, but offers a couple of lower-priced chocolate options for true connoisseurs. I looked into it and realized that I'd never heard of most of the producers. Nor do I care of single-source chocolate. So I'm starting to doubt if I'm really much of a chocolate lover. I'm quite happy to savour a square of Poulain 76% chocolate that I bought at Shopper's Drug Mart, at 2-100g bars for $5. I guess I must content myself with being a coffee snob. One word of advice for those who wish to save themselves: skip the Hershey's and the Cadbury. Ugh. But at least I get to wear my new sweater that I bought at Buffalo in the boxing day sales. Seriously, those sales are ridiculous. Something like 70% off at Buffalo and 50% off at Mexx. Then BOGO at the Nine West Outlet, where I got new boots that were already less than half price and cute spring shoes for $12! Anyway, I had a fantastic holiday this year. NYE was spent at Scott and Kat's place with my date, Max. We had yummy dinner, played with my date, and watched Pirates of the Caribbean: Dead Man's Chest. Champagne at midnight. Some chatting and bed. Then yummy bagels and lox for brunch, more playing and back on the Go train to visit Alex's family in Oshawa. Unfortunately, we got stuck on the train for over an hour for some sort of "emergency" that was never explained to us. I've searched the news for info and haven't found anything. Crazy - we were very late for dinner. But it was still a nice evening. And probably a good way for Alex and I to actually spend some quality time together. We've decided that our New Year's resolution is to have a date once a week. I know, we're really getting ambitious here.